Grapefruit peel may never play a prominent role in your diet, but it is edible, and when you trash the peel, you're also throwing away beneficial nutrients. The peel has significantly more fiber than the pulp. It also contains essential oils, phytochemicals and vitamin C, all of which provide antioxidant protection. Some of the substances in grapefruit peel even show promise for fighting cancer. Grapefruit's essential oils are produced and stored in the peel. The most predominant oil -- limonene, or D-limonene -- is often used to add flavor and fragrance to various foods. Limonene exhibits potent anti-inflammatory abilities, according to the July 2013 issue of "Life Sciences." While more research is needed to prove its effectiveness, limonene also shows promise for fighting some forms of cancer. For example, the June 2013 issue of "Cancer Prevention Research" published the results of a study showing that limonene may kill cancer cells in women with early-stage breast cancer. The nutrients you'll get from grapefruit peel are not measured in the same manner as the fruit's pulp and juice. 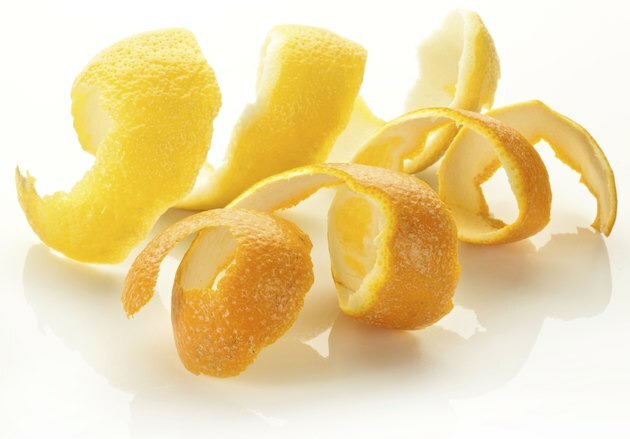 Purdue University reports that candied grapefruit peel has 2.3 grams of fiber per 100 grams of peel, which is about three times more fiber than you'll get from the pulp. Grapefruit peel is especially rich in the soluble fiber pectin, which helps lower cholesterol and moderates the flow of sugar into your bloodstream after you eat carbohydrates. Extracts from the grapefruit's peel contain the well-known antioxidant vitamin C, as well as hesperidin and naringin, which are also antioxidants. Hesperidin and naringin belong to a group of plant-based chemicals called flavonoids. These phytochemicals may fight cancer by inhibiting the spread of cancer cells, according to the Linus Pauling Institute. Hesperidin, or hesperetin, shows potential to slow the growth of tumors in the gastrointestinal tract and pulmonary system, according to a report in the March 2011 issue of the "American Journal of Surgery." Candied grapefruit peel is easy to make, and the sweetness helps offset the peel's bitterness, but it has the disadvantage of adding sugar to your diet. Try using grapefruit peel in savory dishes. Add grated peel to a salad of greens, avocado and walnuts. Top it with a dressing made from grapefruit juice, finely grated grapefruit peel, low-fat yogurt and olive oil. Make a topping for fish or chicken using grated grapefruit peel, fat-free mayonnaise and a touch of grapefruit juice or vinegar. Grapefruit juice interferes with the absorption of some types of medications, causing too much -- or too little -- to enter your system. The March 2009 issue of "Planta Medica" reports that substances in grapefruit peel may also interact with the metabolism of medications. To be safe, consult your health care provider before consuming any form of grapefruit if you take medications. Planta Medica: In Vitro Interactions With Repeated Grapefruit Juice Administration -- To Peel or Not to Peel? Is It Healthy to Eat Orange Peels? What Fruits Are Good for Digestion?